The Waitaki River is not ‘‘lost’’, the president of a community-based volunteer organisation trying to enhance the salmon fishery in the river says. The New Zealand Federation of Freshwater Anglers (NZFFA) has included the Lindis, Pomahaka, Kakanui and Waitaki Rivers on its recently released ‘‘Lost Rivers of the South Island’’ map, which uses skull and crossbones symbols to denote the 70-plus rivers the organisation says are now ‘‘unfishable or have declined’’ for trout fishers ‘‘because of intensive farming and large-scale irrigation’’. 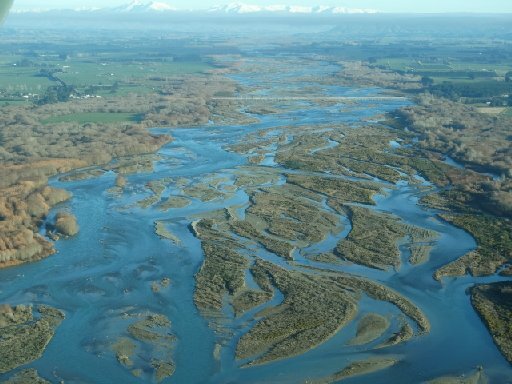 Waitaki Riparian Enhancement Society president Trevor Hill this week rubbished the suggestion the Waitaki River had degraded to a point where it could not support fish, and questioned how it could be compared with the Pomahaka and Kakanui. Salmon numbers were lower now than their historical highs but had been steady for about 17 years, he said. ‘‘There is a problem with the salmon fishery — there’s no doubt about that — but it’s not the river,’’ Mr Hill said. The society established a salmon hatchery programme to supplement the river’s wild stock seven years ago, and like other programmes further north — for the Rangitata, Rakaia and Waimakariri Rivers — the salmon were not returning from sea, he said. Hatcheries at the other alpine-fed braided rivers were putting ‘‘a lot more’’ fish into the river, after raising them for about 12 months, and those fish were also not returning. NZFFA executive member Steve Gerard, of Methven, who compiled the list of rivers described as ‘‘either lost or in noticeable decline’’, said the decline of the salmon runs was well-documented, and defended the inclusion of the Waitaki River on the list as it indicated an ‘‘intergenerational’’ trend. The Lindis River had been included because of low-flow issues, the Pomahaka because of water-quality issues and the Kakanui because of the effect of irrigation takes, and awareness needed to be raised about improving the Waitaki as well, he said. ‘‘The salmon fishery is sort of a shadow of what it used to be and it is certainly a declined river. It’s just not related to agriculture in that river,’’ he said. NZFFA president Graham Carter said because trout and salmon fishers used the rivers differently, the association had its own criteria for calling a river ‘‘lost’’. ‘‘The Waitaki has got didymo in it, hasn’t it? So it’s a lost river. ‘‘Other rivers have suffered through intense extraction of water through irrigation. Other rivers have got willows.‘‘We’re coming from a trout fisher’s point of view.’’Also, the designation did not apply to entire rivers but just parts of them, Mr Carter said. At its headwaters, the Pomahaka was ‘‘one of the best rivers in New Zealand to fish’’, but downstream the river was ‘‘polluted as — it’s shocking’’.‘‘If you did a different map from a salmon angler’s perspective, most of those rivers would be OK,’’ Mr Carter said. There were still places on the Waitaki River that were ‘‘fine’’ for trout fishing too. Central South Island Fish and Game chief executive Jay Graybill said while he understood the NZFFA was trying to make a point, ‘‘in my view they have pushed it beyond reality’’. In terms of ‘‘angler days’’ the Waitaki River had ben steady for the past 17 years at about 27,000 angler days a year, ranking it the seventh-most-fished river in New Zealand. It was ‘‘useful’’ to focus attention on river quality and water quality, but ‘‘applying the term ‘lost rivers’ to all of those rivers — and certainly in terms of salmon — is probably not warranted’’, Mr Graybill said. In New Zealand, in terms of angler days.